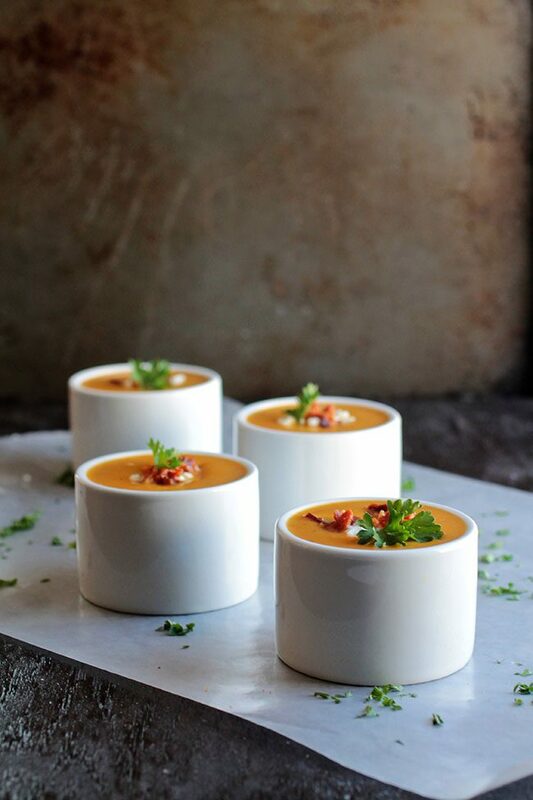 This easy, creamy butternut squash soup is perfect for chilly evenings! Topped with tangy goat cheese and crispy bacon. I honestly don’t repeat meals all that often (the blessing/curse of being a food blogger). Once a recipe is developed and shot and posted and eaten, it kind of falls away to make room for whatever new bloggy things I’m dreaming up. 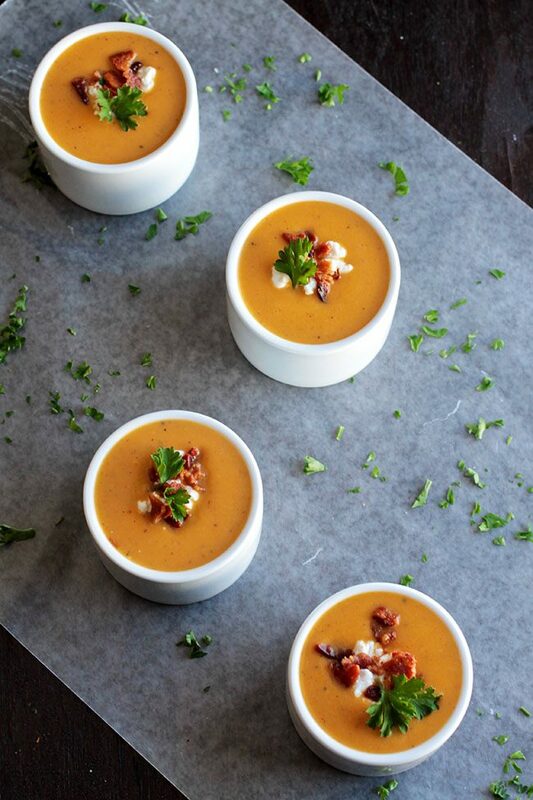 But this butternut squash soup is an exception. I think I’ve made it three times in the last month (which, for someone who makes their beer money by putting up NEW recipes every week, is practically unheard of). But I can’t help it! It’s just so creamy and it has this crazy amazing flavor and DID I MENTION THERE’S GOAT CHEESE. I get sucked into this butternut squash soup time after time because it has this deep, rich, earthy, butternut-squash-and-goat-cheese-y flavor that is the completely perfect cure for winter. It’s also deceptively easy – the soup is thickened by the onions and butternut squash that go into it, so there’s no need for a roux or any cornstarch thickening craziness or fancy techniques or blah blah blah. Just a few simple things from the pantry, 20 minutes or so on the stove, and some quality time with my immersion blender. 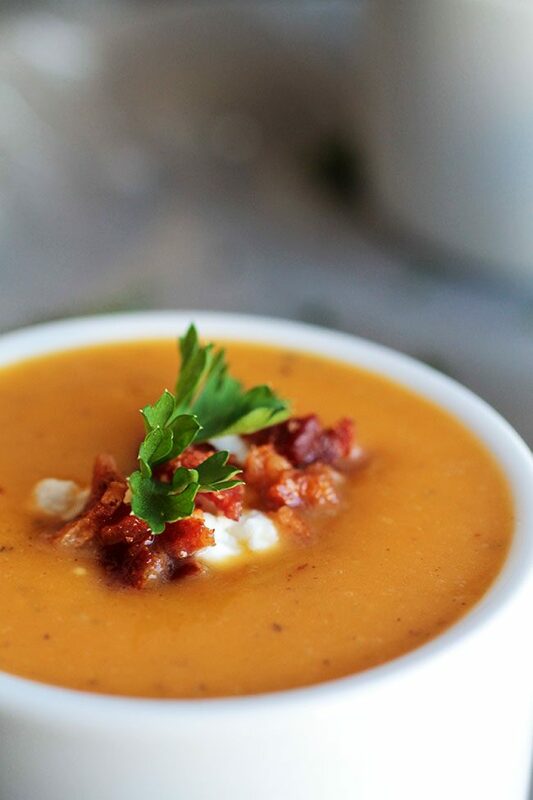 I also loooove the crispy bacon on top of the soup here. I fried up the bacon in my soup pot, then let the crispy bacon hang out on a plate while I sautéed the onions in garlic in the rendered fat. Side note: I really hate saying “cook things in fat.” It just sounds so unappetizing – which is crazy, because actually it makes things DELICIOUS. Let’s just call it “bacon juice” or something instead, eh? Unless that makes it sound worse? The onions and garlic get caramelized up right nice in the bacon juice (we’ll keep workshopping that), then a bit of stock deglazes the pan and the butternut squash gets thrown in and from there it’s just blending and stirring and topping with bacon and HAPPINESS. 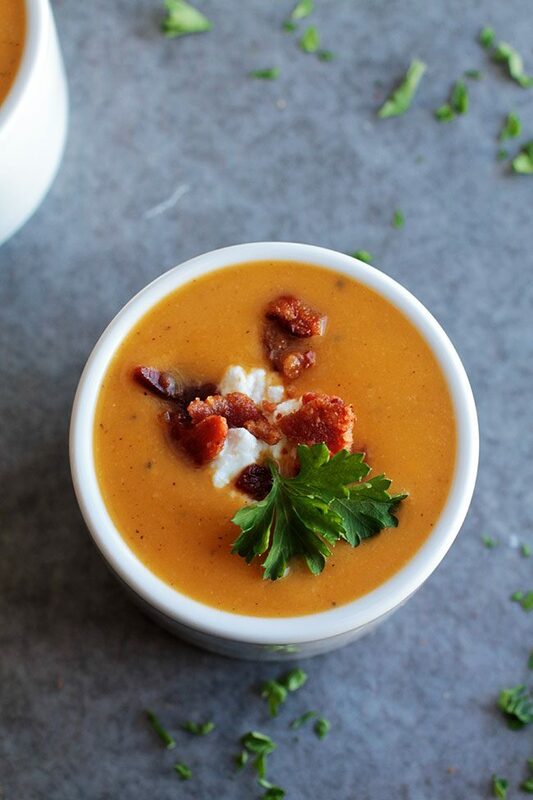 The extra bite of the goat cheese garnish paired with the smoky, crunchy bacon bits makes those first few spoonfuls taste like heaven, and the silky butternut squash soup folds you into it like it’s a nice warm hug and winter totally isn’t even a thing. 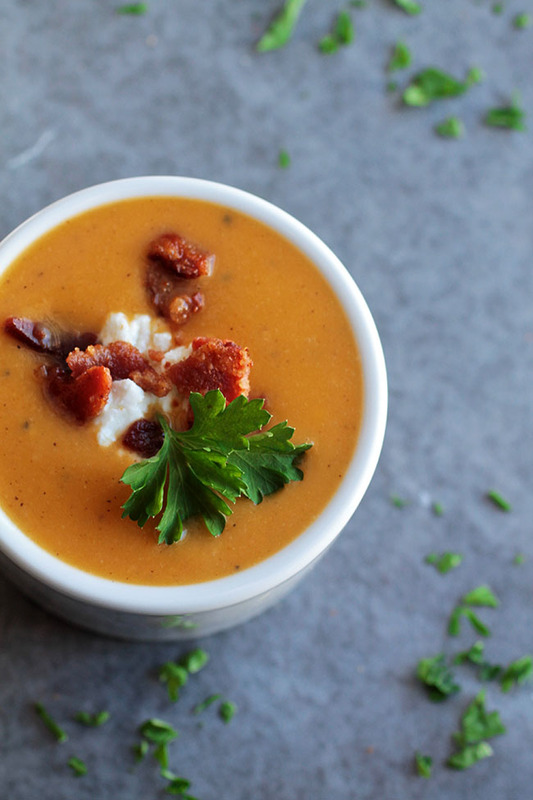 Roasted butternut squash soup with crispy bacon and tangy goat cheese. Put diced bacon pieces in a large pot over medium heat. Cook until fat has rendered and bacon is crispy, about 7-10 minutes. Remove cooked bacon to a paper towel-lined plate and set aside. Leave the bacon fat in the pot over medium heat. Add chopped onion and garlic to pot and stir to combine. Sauté in the bacon fat, stirring occasionally, until onion is translucent and slightly browned, about 4 minutes. Add a splash of stock to the pan to deglaze, and scrape up any browned bits with a wooden spoon or stiff spatula. Add the rest of the stock and stir to combine. Bring mixture up to a simmer. When soup is simmering, stir in butternut squash and bring the mixture back up to a simmer. Remove soup from heat and blend with an immersion blender until smooth. Add goat cheese to soup and stir until cheese has melted. Add milk to soup and stir to combine. I like to use my immersion blender one more time here: blend until all milk and goat cheese are completely incorporated and the soup is smooth and velvety. Ladle soup into individual bowls and top with a sprinkle of goat cheese, a handful of the bacon you cooked at the beginning of the recipe, and a sprig of parsley. Serve immediately and enjoy! 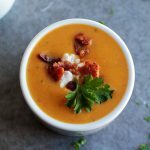 I roast a butternut squash every few weeks, puree it, and keep it in the fridge to use as needed for recipes like these! I love having roasted squash on demand for soups, risotto, and pasta sauces. To make your own puree, halve a large butternut squash and scoop out the seeds. Place cut-side down on a baking sheet and bake at 400 for 30-45 minutes or until squash is easily pierced with a fork. Let cool, then scrape roasted squash into the bowl of a food processor and give it a good whirl to blend it into a puree. 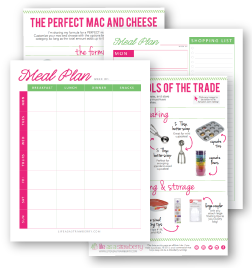 Store in the fridge for up to a week and use as needed for recipes like this one! You can use uncooked butternut squash in this recipe if you like – you will just have to extend the cooking time so that the squash cooks through while it simmers in the stock in step 6. If you don’t have an immersion blender, you can blend soup in a regular blender. I love this immersion blender! For more unique immersion blender recipe ideas, check out 10 Ways to Use Your Immersion Blender! If the soup is too thick, add a little more milk to thin it out. Too thin? Blend in another 1/4 cup or so of roasted butternut squash to thicken it up or simmer it an extra 10-15 minutes on low heat. To make this soup vegetarian, omit the bacon from the recipe and instead sauté onions and garlic in 2 Tbsp. of olive oil. To make it vegan, omit the goat cheese as well and substitute almond or coconut milk for the milk in the recipe. Serve with easy crusty French bread! This looks amazing, I think I’ll try it out for a Thanksgiving appetizer (I’m in Canada, so Thanksgiving is in a couple of weeks). I love that you provide instructions to make it vegetarian/dairy free etc. I eat bacon and cheese but I do have friends with allergies and preferences so its nice to include that sort of info. Really appreciate it! I don’t have a food processor. Can I use my immersion blender to puree the freshly roasted Butternut squash? I would just add the butternut squash to the soup as is and puree it all together with the immersion blender at the end! You could even cook some chopped butternut squash right in the soup and then puree if you don’t have time to roast it. Hope that helps! 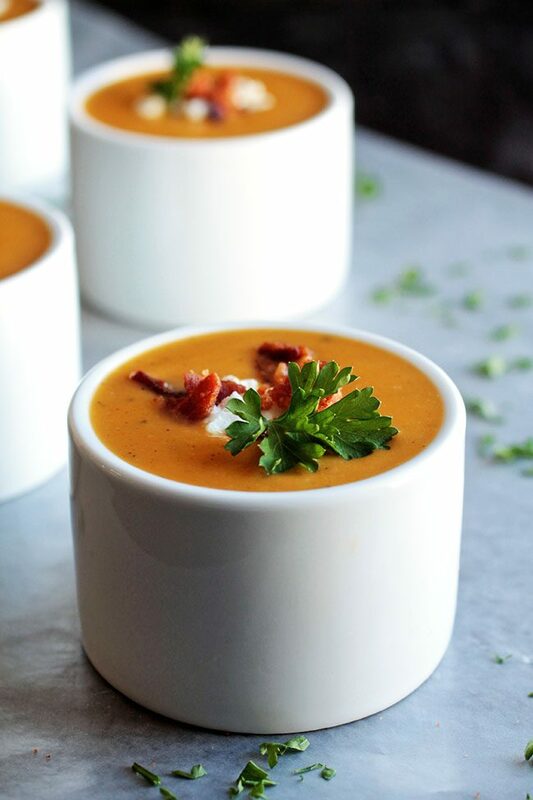 Just made this soup after roasting a few butternut squash for purée needed for Thanksgiving, the only thing I did different was use pancetta instead of bacon. Absolutely the best soup I have ever had! Thank you for shaing this recipe! I’m so happy you liked it! LOVE the idea of subbing pancetta for the bacon – I’m definitely going to try that next time. Thanks for letting me know how it turned out! I can see why this would have been a repeat offender for meals. The soup look gorgeous and I bit it is quite tasty. Thanks, Anu! So glad you liked the post!